Who are you and where in the world are you? Hi, I’m Kathy Nielsen. I live in Boston, Massachusetts, home to one of the domain industry hot spots in North America. We’ve got several big domain industry players here but most people, even in our industry, don’t even realize it. Elliot Silver, Dave Evanson, EIG, Sedo, Afternic and Buy Domains are all here, not to mention a few other big domainers. You have a long history in the domain industry, tell us a bit about your background and what you are doing at the moment? I’ve been in the digital marketing and advertising world since 2001 and moved into the domain name industry in 2008 when I joined Sedo as Director of Brokerage. I worked at Sedo for several years, moving up from building and running the brokerage and auction division to VP of Business Development for Registry Services. I really loved working with all the registries, old and new, and decided that was the where I wanted to be. I ended up moving to .Green, joining them to prepare for their launch. It was a great opportunity to go through the cycle of a new gTLD launch. Now, I’m working with Neustar. It’s really a dream job for me because I get to use all the aspects from my past. I work with new and legacy TLDs, Neustar owned and operated TLDs as well as their customer registries, registrar partnerships, premium names, auctions and end users. I’ve been with Neustar since late 2016 and currently do a lot with .nyc, .co, .biz, .us and .tel. 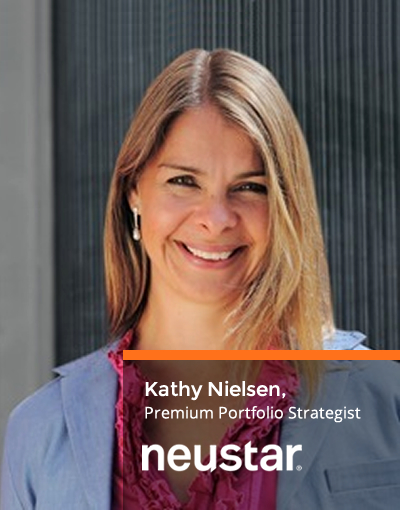 I also work with some of Neustar’s registry customers, supporting them with their premiums, marketing and distribution strategies. At the moment, I’m doing a million things but one of the larger projects I’m working on is the first .nyc auction of 2018. The marketing planning and execution is really a major initiative so we’re working on that and will make the official announcement in early April. It’s going to have some stellar names and the best part is, bidding starts at only $500 so it’s very accessible. Anyone with a physical address in one of the five boroughs can get in on the bidding and have the chance to get a fantastic premium domain for a steal. In past auctions, we brought in local individuals, agencies and businesses to bid and win some really great names. It’s not easy to get end users to an auction but we’ve been able to do just that and it’s been great to see some of these strong, premium .nyc names get into the hands of those end users who want to put them to use. Neustar most notably operates as the Registry for .co, .biz, and .us, how are premium names in these TLDs performing? .CO premiums are really stand out names. There are so many private sales out there that we don’t get to report and it’s too bad. We try our best to get as much as possible into the public sales databases and continue to do so. That said, the premiums have a very strong valuation and we see most of them selling well above 50K. The registry continues to have a strong focus on direct-to-consumer marketing within the start-up and entrepreneurial communities. In March, we’ve been working with women entrepreneurs and leaders and have a major B to C campaign running called Be Courageous. You can see some of the campaign elements at BeCourageous.co. Our marketing covers the globe and I can really see how it has made a huge impact on the value of the .co TLD over the years. With .biz, .us and .tel, there are other premium narratives at play. As legacy TLDs, they didn’t launch with premium names as we know them today. However, each has a premium story. .BIZ had reserved the 1 and 2-character names and only began to release them in recent years. Some of the 1-character domains were sold in 2011 in a high-profile auction at Sedo. More recently, in late 2017, the registry began to release some of the reserved 2-character domains. They have been selling at a steady pace, and we still have a nice group of them for sale on the premium marketplaces as well as distributed through many registrars that are connected to the premium distribution feeds. .TEL has another unique story with premiums. The registry moved to a new gTLD contract in 2017 which allowed them an opportunity to make a few changes. The first change was to lift all prior restrictions on the use of a .tel and it is now a truly open, generic gTLD. Are there any names reserved at the moment which might be released in the future? The .US ccTLD has most of its 1 and 2-character domains reserved by policy and have never been released. Neustar, in coordination with the .US stakeholder council, have reviewed a proposal for the release of many of those domains. The recommendation was for Neustar to present that proposal to the US Department of Commerce for approval. In terms of marketing, we’ve increased awareness campaigns for .US targeting young adults and early adopters to the social internet. These marketing campaigns along with a general increase in awareness stemming from the launch of new gTLDs has resulted in a new focus for .US. Consumers are seeing many naming options and are willing to be creative with a reliable and trusted brand like .US. Do you have any advice for a domain investor looking to acquire a reserved name, either with Neustar or any other registry? Definitely! Every registry is different, so it is important to connect and have a discussion about the domain you want. If you see that a premium name listed for sale with the registrars, it’s likely that it is a premium tier domain. These are not easy to pull out of the tier price inventory to negotiate so it’s very unlikely that will happen. If you really want a tiered price name, I’d recommend getting it like anyone else would, at your registrar. But if you see super premiums, those higher value names, definitely do some research. Is it on a premium marketplace? If yes, that is a good sign it is super premium. If the whois says it’s reserved, that is also a good indicator that you will need to check in with the registry on its status and find out if they are willing to sell it. The registry will be able to work directly with your registrar to get it registered should you come to an agreement. Most registries are open to a sale and negotiation, but keep in mind that the goal is to get domains into the hands of registrants that will develop and use them. If you have a plan and want to talk to the registry about acquiring a reserved domain, make sure you are prepared to share that proposal. You might also expect it to be part of any sales contract should you come to an agreement. The active use of a premium domain is a very important piece of the overall strategy for a registry and the long-term growth and health of a TLD. You spend a lot of your time talking to end users about premium and keyword names, how has the discussion changed since the new gTLD program started? We quickly see that someone else is already using that domain name or it’s owned by an investor.. This is when it gets fun. We have a discussion about alternatives including new gTLDs, how they came about, looking at companies that use them (I love the makeway.world website, it has fantastic examples that are constantly updated) and how they can play an important role for that new company. In the end, we come up with a list of appropriate domains for that company and they usually buy several. Some are rich in keywords, which may be in the TLD itself, or even keyword combinations to the right and left of the dot. Keyword domains tend to be part of a domain portfolio and strategy and less of a company name. Generally, companies offer many products and services so they like to choose something short, memorable and catchy for their name, then use keyword domains for supporting ad campaigns, product details sites, etc. At some point, they may also acquire the .com but in most cases, they find so many suitable alternatives to start out. The naming possibilities for meaningful marketing campaigns, URL shortening, as well as available, memorable and brandable company and product naming options are just more abundant today. This is very good for the consumer. Some domain investors can find it difficult to establish contact with end users, do you have any advice on how to get your foot in the door and how to ensure a sale once contact is made? My approach is always outreach to those companies that I think might be interested. I’ve been told from many end users that they often get arrogant toned emails or calls saying they have to get domain.something because it is a perfect fit for their business. Then the price is astronomical. First, I never tell an end user the domain I have for sale is a must for them. I begin a conversation about them. Their strategy, why I reached out and why I thought of them for this domain. In the end it might not turn out to be a good fit but each conversation I get with an end user is valuable. I learn why companies might not NEED the domain I think they need or would be a perfect fit. Don’t assume. Listen, make them aware, and have a conversation. You’ll learn, you’ll improve your targeting efforts and you’ll have better success. When you get to that conversation point and discuss price, make sure your price is in line with market value. If you want to sell, know the market. The market is not based on the miniscule amount of domain sales that go for a million dollars. If you are in that boat, plan on holding out a long time for your sale. Those usually come when the buyer comes to you. What is the most inspiring domain sale you have seen? The sales that are most inspiring to me are the ones where the buyer puts the domain to good use. I am inspired when I see what happens to the domain, how it gets built out, how it is used in marketing, and how it can turn into a brand of its own. Every great story helps in the education of new buyers out there, and supporting the value of a great domain. I’ve certainly been involved in many 6 and 7 figure domain sales over the course of my career, but the ones I find really inspiring don’t have to do with the sale price, it’s more the use cases I find inspiring. What are you most looking forward in the domain industry for 2018? That’s a tough one. There is so much going on but what I’d really love to see is continued innovation on the ecommerce side of things. I’m looking forward to seeing some registrars, hosting companies or website builders adopt technologies that use more advanced technologies like machine learning (ML) and artificial intelligence (AI) to help to make the domain shopping experience more meaningful and successful for the consumer. This may be wishful thinking, and I’m usually a few years ahead of myself with this kind of thinking, but it is coming, it’s just a matter of when. With so many new naming options, a more intelligent search and discovery experience is really needed for consumers. ML and AI have so much promise to help make the discovery and buying experience more intelligent.